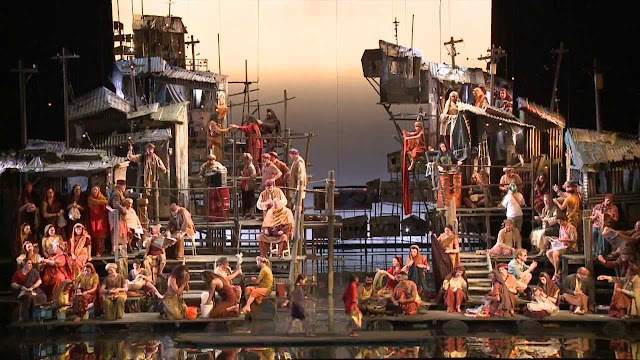 For the first time in over 100 years the Metropolitan Opera presented Bizet's Les Pêcheurs de Perles (The Pearl Fishers). Unlike most of the audience, this was my fourth time, including once in San Jose, once in San Francisco and once in Santa Fe. 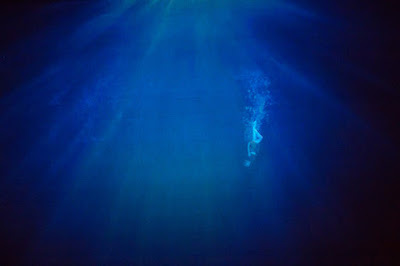 We were put in the mood of actual pearl divers with what appeared to be a film of people diving into deep water. It was instead a kind of Peter Pan harness that looked amazingly realistic. The famous duet was even more beautiful than I anticipated. I did not take into account the fabulous conducting of Maestro Noseda. He brought new lyrical qualities to the entire opera. This is the most I have liked Mariusz Kwiecien who was perfect in his role. I have always liked Matthew Polenzani. Their voices were as perfect together as I thought they would be. This revival was requested by Diana Damrau. She brought many qualities to the role of Leola: wonderful coloratura technique for the coloratura parts and power for the increasingly dramatic requirements as the opera progresses. This is a big hit in New York. All are predicting it won't be 100 years before we see it again. What anyone likes about this opera is the music and the singing, spectacularly well done today. What anyone doesn't like is the plot. Leila has been hired to protect the pearl fishers from their constant exposure to the weather. She is to sit alone by the ocean and sing to the god Brahma. She fails miserably at this. Nadir promises his friend Zurga that he has gotten over their mutual interest in Leila, the priestess they both simultaneously fell in love with years before. Zurga does not similarly make such a promise to Nadir. This doesn't matter because Nadir is lying. It is important to notice that Nadir immediately recognizes Leila when he hears her voice, but Zurga does not. This tells us that only Nadir truly loves her. Zurga only allows them to escape because of the contrived deus ex machina, this time a giant pearl on a gold necklace. In this action he betrays the pearl fisher community whom he has sworn to lead. Because of Leila's inattention, they have been hit by a tsunami, fascinatingly evoked in the projections. Sometimes Zurga is just left standing there, but sometimes Zurga dies at the end. For me this works better. Nadir seems to legitimately love Leila, while Zurga doesn't really make his case. He is jealous for its own sake. But what logic forgives Leila? Would we like it more if Zurga killed them instead? One can't help wondering. My wife and I just returned from two weeks in central Europe and saw this HD cinecast at the megaplex in Split, Croatia. It was the second "Pearl Fishers" for us, as Opera Colorado had performed it in 2009. 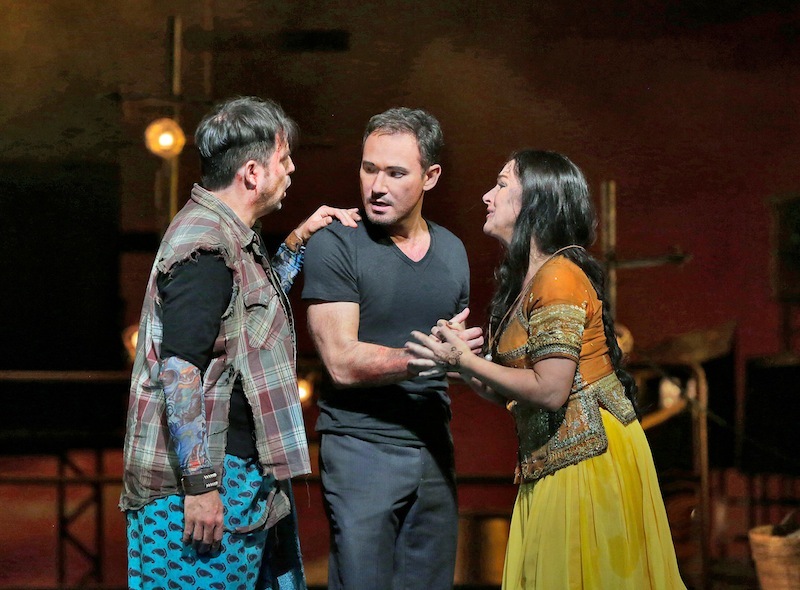 No question that the tenor/baritone duet was the vocal highlight of the performance, and Damrau was consistently excellent throughout. If I have any beef at all, it's with the money the company spent on the opening ballet. Sure, it was cool and offered a pleasant introduction to the plot as the orchestra played the overture, but I can't imagine all that equipment came cheaply -- plus it's not as if the Met can recover the cost by using it elsewhere. It's just like that field of poppies in "Price Igor" and a perfect example of spending lots of money for a one-off extravaganza during a time of fiscal challenges. BTW, the cinecast in Split attracted 35-40 patrons, none of whom appeared to be under 50. The ticket price came out to about US$12, and theater management offered up free champagne and Guylian chocolates at intermission.